This then & now pairing shows a 1960s view of numbers 12 and 13 Castle Green, the origins of which have been the source of much speculation in recent years. The scene looks remarkably unchanged today, save for the differing garden features. Norman Stevens proposed in Kenilworth History 2001 – 2002 that these properties might once have been the site of an ancient Chapel of Ease. 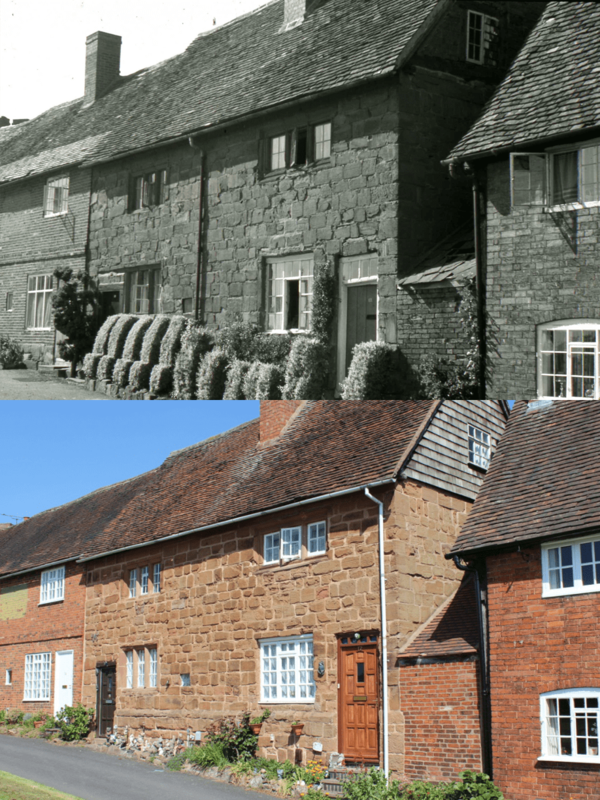 Norman described the properties as being “one of the very few, if not the only, stone-built vernacular buildings of Kenilworth whose building date is indeterminate”. Norman’s justifications for proposing this are various, such as the east-west orientation of the buildings, the existence of a small squint window, the presence of arrow sharpening marks in the stonework (commonly found by church doors, as indeed they are at St Nicholas’ church) and a ‘scratch dial’ by the door which would arguably have been used by the villagers to tell what time the next mass was due. The implications of this tantalising proposal for early history of Kenilworth are huge, because it shifts the probable ‘old town’ of Kenilworth from the High Street to the area in which the Norman castle would later be built. Norman stands by his proposal today, although he has provided a small addendum to say that he’s “no longer too sure about the squint, although it’s in the right place. It’s not quite right inside the house”.